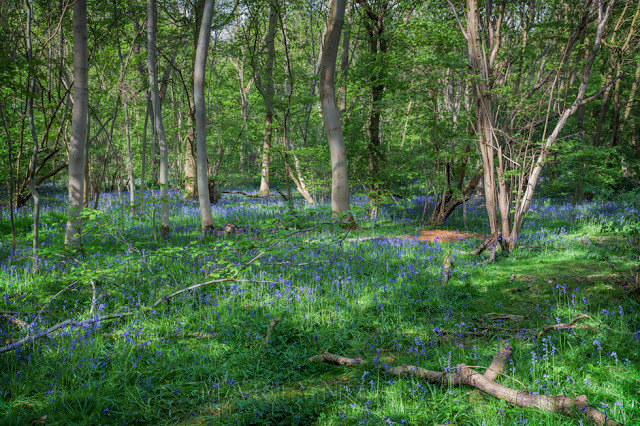 Following on from my recent visit to see the bluebells at Brampton Wood, I took a trip over to Waresley & Gransden Woods to do the same. I was in two minds whether to go, as there are only so many shots of bluebells you can take in a season until they all start looking the same, so I didn't have high hopes in getting anything new. Of ancient origin, having been part of the local landscape for thousands of years, Waresley and Gransden Woods are a 54 hectare biological Site of Special Scientific Interest that contain predominantly ash, maple and hazel, with parts of the wood replanted earlier this century with oak, beech and sycamore. They are home to many breeding birds, an abundance of wildflowers, and over 500 species of moth and butterfly. A view from one of the little bridges that cross the stream, as you can see, no water in sight. 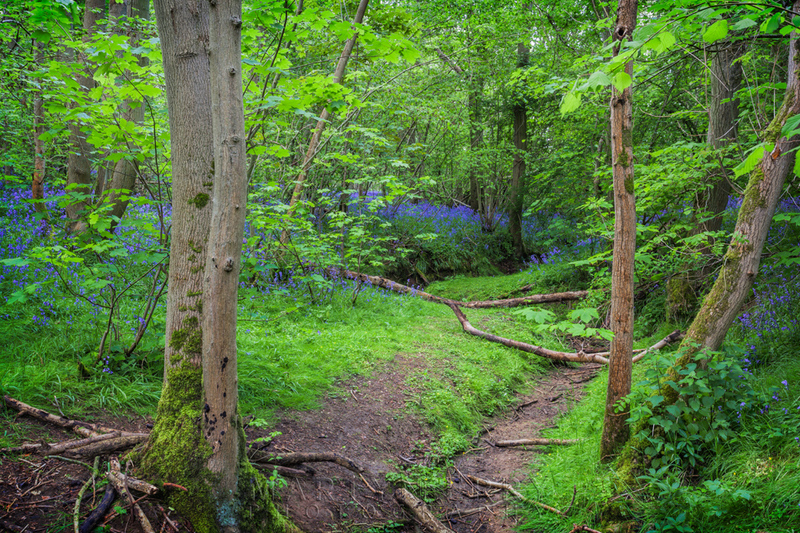 Thankfully, my misgivings about seeing the same old views of a broad, flat woodland carpet, festooned with azure flowers, puncutated by slender trunks were not fulfilled. And I'm aware I sound like a growling curmudgeon, bemoaning the view of a classic English springtime display of such winsome exquiteness, that it's practically a treasonous offence. 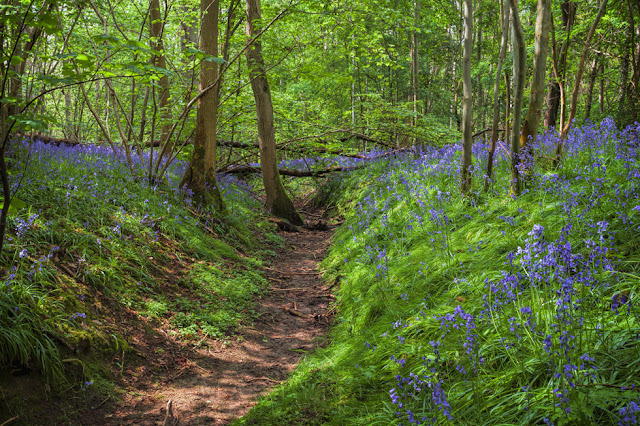 But, I have photographed a lot of bluebell scenes over the years, and it's nice to find something new, that's all I'm saying. A shot after having ventured down the stream bed a little way. The woods of Waresley & Gransden are two seperate woods that basically join together, but for the seperatation of a small, winding woodland stream, and it was this stream, or to be more precise the lack of it, that made my visit so enjoyable. 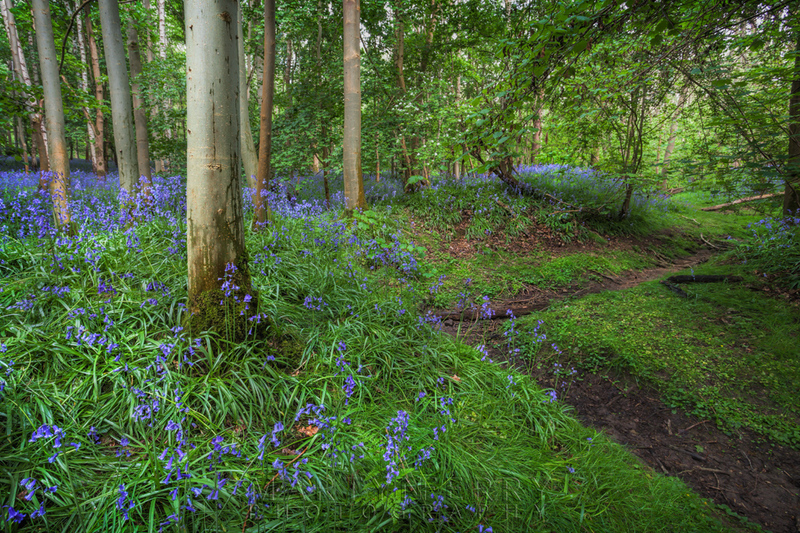 And the beautiful bluebells as well of course. I have no wish to be invited to an extended spell in the tower, so definitely the bluebells as well. 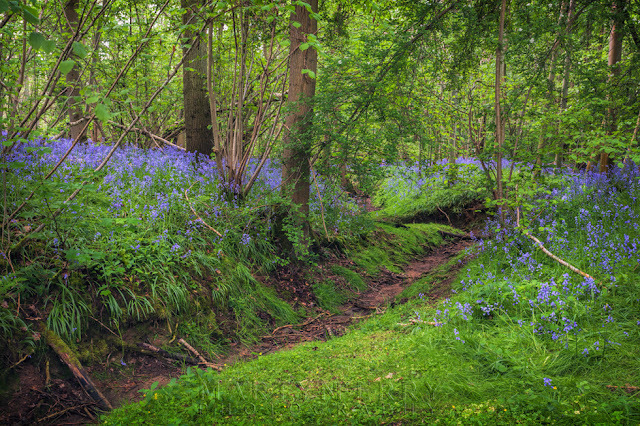 It would have been nice to have some flowing water, to go with the bluebells, but it had its benefits. Unfortunately the stream had dried up, as so many have this year, which was a shame, but it enabled me to wander along it's course and get some images of the sapphire spring flowers that I couldn't have done otherwise. There were no footpaths alongside the stream, and I wasn't about to start damaging these delicate blooms or go traipsing through the very flowers I wanted to photograph, so the thirsty stream bed made a perfect avenue through the bejeweled weald. As with many places, this spot will be well worth another visit, when the stream is back up and running, whenever that will be. Looking along the path of the stream bed, with the banks full of flowers. An old tree stump, probably hundreds of years old, at least. 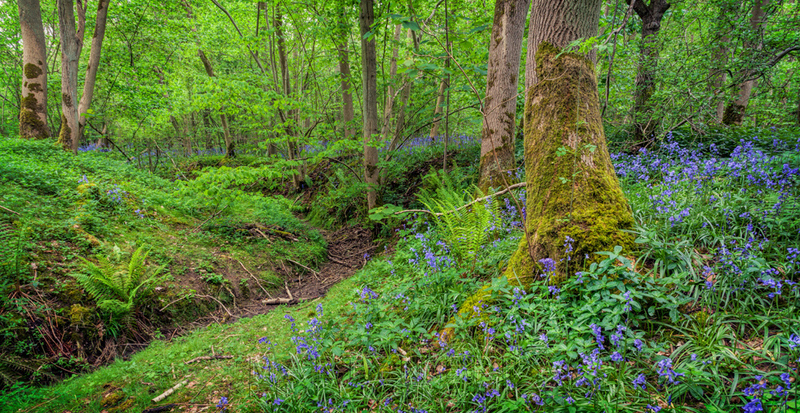 A panoramic of the colourful woodland. To view a larger size just click on the image. 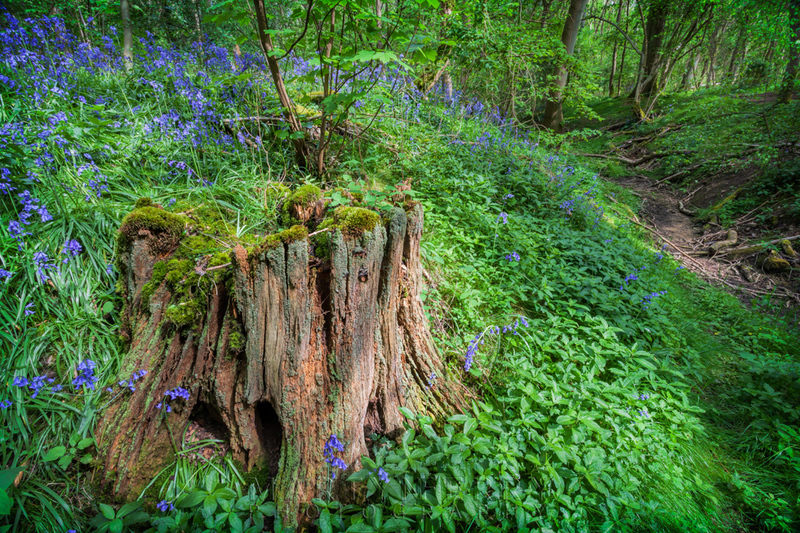 A moss covered tree, some bluebells and a section of the twisting stream bed. A scattering of bluebells in the dappled sunlight. View across an enormous badger set that has obviously been there for quite some time.